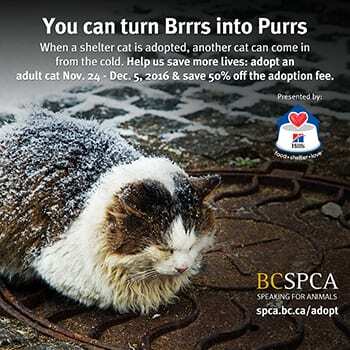 As temperatures across the province start to drop, the BC SPCA is encouraging people who are thinking about adopting a furry family member to consider cats, and turn brrrs into purrs during its upcoming adoption event, presented by Hill’s® Science Diet®: From Nov. 24 to Dec. 5, all adult cat adoption fees are 50 per cent off. Chortyk notes the adoption fee includes vaccinations, spaying or neutering, permanent ID, any necessary medical care, and internal and external parasite treatment. Normal adoption counselling and matching takes place to ensure animals go to a good home, and Petsecure provides six weeks of free pet insurance. All cats are microchipped, and for only $12 annually or a $45 lifetime fee, the animal will be registered in the province-wide BC Pet Registry, bcpetregistry.ca, to help ensure if a pet is lost, he can be found and reunited with his family. “We’re excited to have the Hill’s Food, Shelter & Love® program continue to support these adoption events that encourage pet guardians to find their new best friend,” said Joe Giles, General Manager of Hill’s Pet Nutrition Canada.